IMHere allows you to chat with your friends and exchange photos made with your Blackberry's camera. The application is the number one MSN messenger for mobiles. 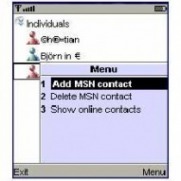 It is simple to use and gives you direct access to the MSN messenger network. iSkoot is a program that puts Skype on your Blackberry. As a result, you can make calls to people, chat via IM and even receive Skype calls to your mobile. You can also use iSkoot to make cheaper international calls using the SkypeOut service. This programs integrates Jaha functionality to your BlackBerry. Jaha is a service that offers cheap international calls and free calls between users anywhere in the world. This is a program to share pictures taken with your BlackBerry camera with friends or other relatives which have a compatible phone or PC. With radar you can just start with instant sharing, browsing and commenting anytime and anywhere on your Blackberry. IM client for BlackBerry that lets you connect to almost all the IM or chat based networks such as Gtalk, ICQ, AIM, Yahoo, GaduGadu, QQ & Jabber. This program lets users now have a native application that will not only upload photographs to Flickr, but automatically geotag them. The program automatically files the pictures to the right album, allows you to tag them and will automatically adjust the size prior to uploading. This is a nice program for the BlackBerry that lets you access Facebook directly from you device, without having to log in through your web browser. Here is a myspace application for your BlackBerry.